We didn't take a picture this week, but we started up BB baskets again. We have decided that we are summer basket people. In the winter there are too many squashes and hard veggies that we just don't use. Anyway, after having Garey live with us and his use of fresh veggies and fruits, we realized that we needed to get back into having more fresh things in the house. This week was a good week for us and we have already used a lot of the products. I was at a car wash for school today... So baby and Husbits picked up the basket. Here is what I was told we got. We got: 3 bundles of leafs, 1 pack of tiny trees, 2 big heavy round things, 7 yellowy red hard things, 3 red soft things, 8 bunched up old timey telephones, and a pack of waffle toppings. Oh, and a dark green bumpy dinosaur egg. 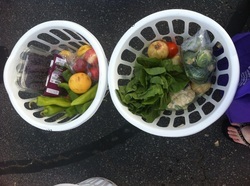 Bountiful Baskets 9/8/12 - Strawberries, bananas, 6 peaches, 6 oranges, plum/apple things. Lettuce, broccoli, corn on the cob, tomatoes, potatoes & long stemmed onions. What a great week! I have decided that we are going to go every other week with a basket. There are lots of reasons for this, but mostly because they tend to have the same ingredients for several weeks in a row and if we haven't finished the huge bag of cherries or the brussel sprouts in one week, getting another huge bag the week after is no good. Most of the veggies last through 2 weeks and we just buy fruit from the grocery store on the other weeks. I have noticed that the fruit is way more tastey from the BB, but it is also way more fragile and goes bad quickly. I am still on my green smoothie kick and T and I have one nearly every afternoon, so the fruit when it starts turning just gets put int he freezer and we eat it then. It has been a pretty good set up, all in all. I have tried 2 Brussel Sprout recipes this week... neither were a huge hit, but we ate BS, so I guess that is a win? We got a kinda weird basket this week...But it should be easy to use. Our basket contained: Radishes, cauliflower, kale (again! 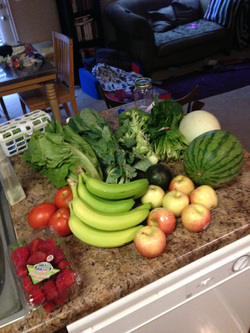 ), tomatoes, banana squash, corn, peaches, plums?, bananas, melon, and blueberries. The disappointing thing this week was that the peaches and the plums started going bad on the first day (Sunday) that was super annoying!! Pete made a delicious peach cobbler on Monday and we froze a bunch of the plums for my smoothies, but it was still annoying. I have been eating a green smoothie almost everyday...with peanut butter and bananas you can't taste the kale. I made one with just fruit and there was a bitter after taste, so peanut butter is the key. We haven't used hardly any of the other veggies... we are going to make mashed cauliflower with meatballs and we've used the tomatoes and we will eat the corn this weekend, but the banana squash and radishes, EEKK!! I made homemade blueberry muffins today. I will put a picture when I get home. June 16th - Worst Basket Ever?! We were supposed to pick up our basket at 9 am, but at 8:30 we got an email that our truck was delayed and hour and to push it back to 10am. So, we had a leisurely morning and walked down to the pick up site to find no truck. The volunteers there said a half hour; that seemed doable and we waited. About 5 minutes into our wait they moved us from our spots in the shade to a sunny spot and made us start to line up. Again, making us think it was soon. After 20 minutes of baking in the sun, we were told it was going to be closer to an hour before the truck showed. Apparently the driver went to the other towers in South Jordan (not a block from the one we were at) and when he didn't see anyone, did he call? No, he just left and headed to the next location. He had to deliver to Draper and Bluffdale before coming back to us. Then, about 11:15 (having been told to show back up at 11:30 by the volunteers, I get an email saying don't come till noon). Annoying? Yes. I wondered why they didn't update us via email as they have said they will do since 8:30? But, I had a fancy Tupperware Party (see Rants & Raves for that info) at 1:30 so I just sucked it up and went grocery shopping. At 11:45 I drove to the site and the truck still wasn't there, I hurried and ran to the Dollar Tree and showed back up at 12:05. the truck was JUST pulling in... Then all the sorting and processing had to start and it was ridiculous. We were standing in the sun and they wouldn't let anyone help just the few people there with official "Nametags" were allowed. It took almost a half hour! When I finally got my stuff and sped home it was 12:40. Oy! I was super stressed. I am not sure the value of the fresh food is worth this stress. We'll see if it happens again. We still have the melon and the acorn squash from last week and we'll need to use those tomorrow probably. It really is a lot of fruits and veggies to eat in a week. June 9th - First Basket Ever! 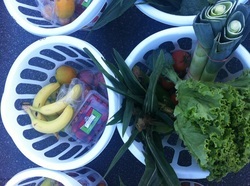 We signed up for Bountiful Baskets http://www.bountifulbaskets.org/ and we got our first basket today. I want to keep track of what we get, just out of curiosity and tracking on my side. All in all it seems like a pretty good batch. We've already eaten 4 different things today...seems like a good start to eating more fresh food to teach our baby how to eat fresh and local. Excited to see how the rest of the week goes and how much of it we eat by next Saturday!